I was asked by a friend to find some good crochet baby blanket patterns to get her started on a new project. 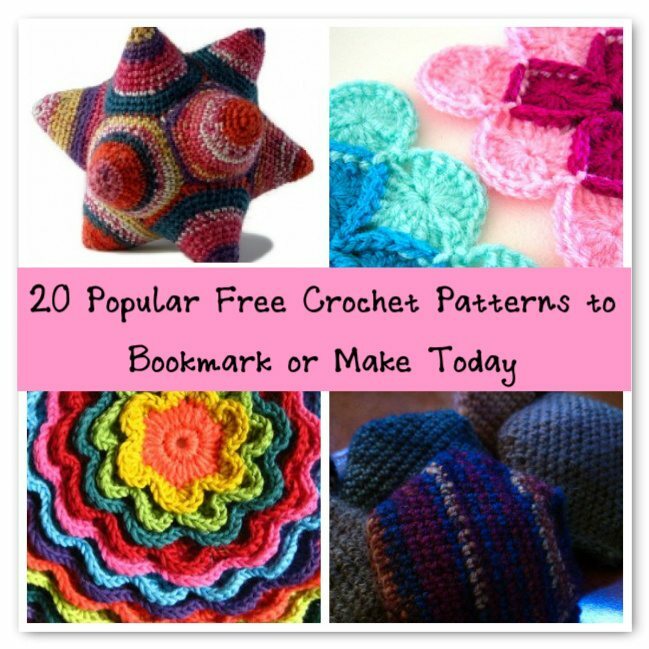 As a result, I spent a lot of time browsing the terrific eye candy of great crochet patterns online. 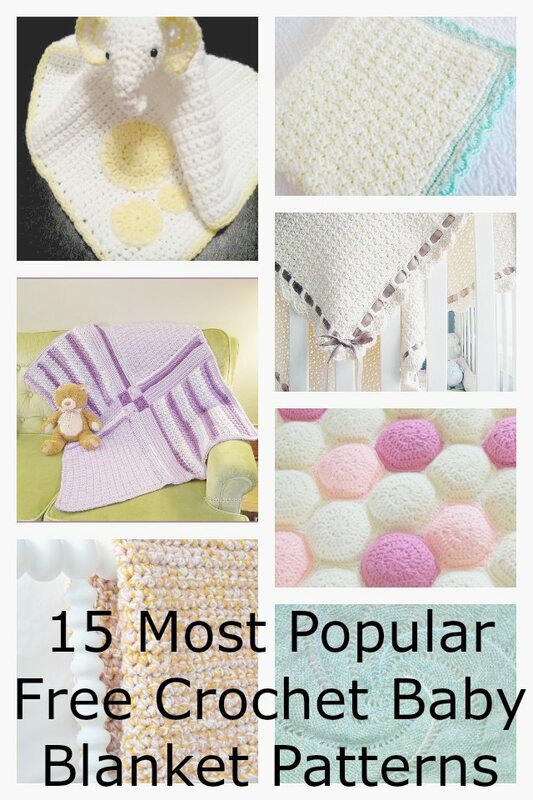 That inspired me to put together a roundup of some of the most popular free crochet blanket patterns for babies. Mary Thompson’s A Blanket for All Seasons, which is available as a free Ravelry download, is one that can be personalized in many different ways, particularly in altering the edging decoration (shown in white on the photo above). This is designed to be a 23.5″ square blanket, however she provides helpful tips for making the blanket bigger. 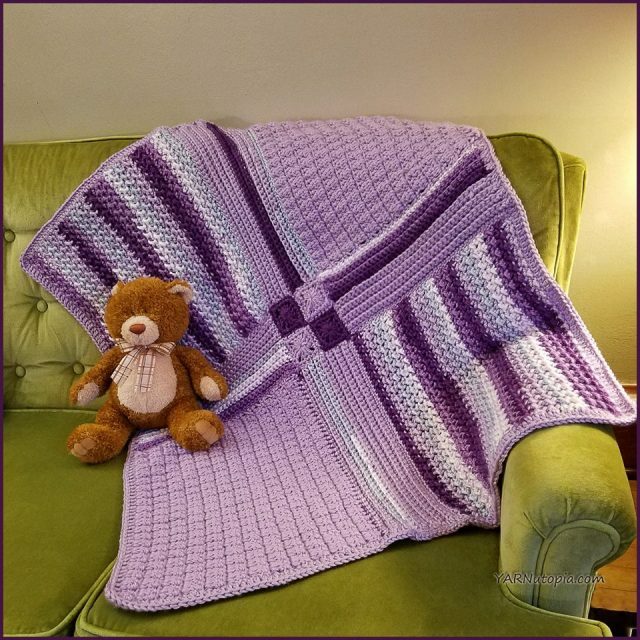 This is a great crochet pattern because you can make many of these blankets for all of the babies in your life and no two have to look the same. This crochet blanket pattern is actually designed to match a baby hat pattern by the same designer so you can create a set if you are making this as a gift. 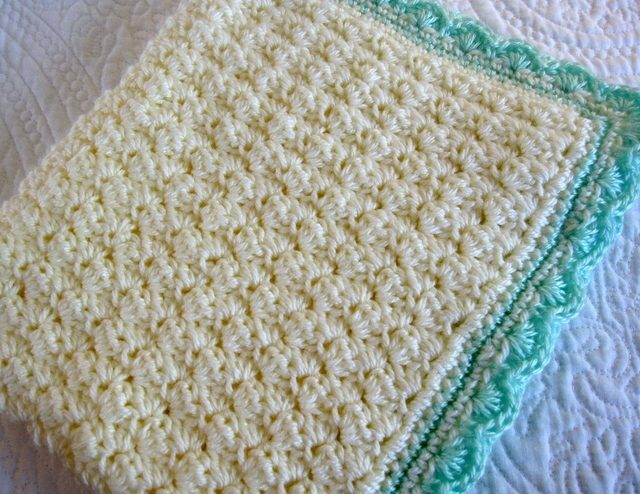 The stitch pattern on the main portion of this crochet baby blanket is easy and creates a lovely texture. It is made using a fun combination of single crochet, half double crochet and double crochet stitches worked together in the same stitches with spaces in between. 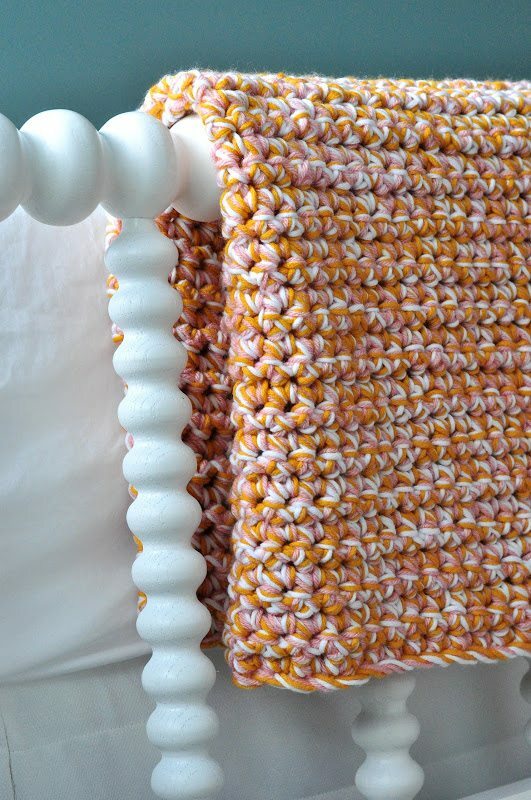 The shell edging adds decorative flair, especially when worked in a different color as shown in the free crochet pattern from Modern Grace Design. This pattern is in English and has been translated into more than half a dozen languages. Sonea Delvon shares the circle crochet pattern for this baby blanket as a free download on Ravelry. I love that it’s a non-traditional shape, worked in the round and creating a lovely decorative swirl that feels soothing and safe, which is exactly what you want when you are making something for a baby! If you have never worked in a spiral before, this pattern will teach you how to do it. 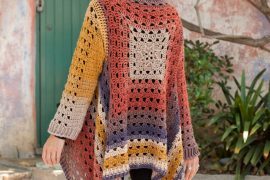 The pattern is designed to be a cotton blanket that is 51″ in diameter, but you can adapt the size and change the yarn as you please. Moogly calls this the Go Team baby blanket because it can be worked in your favorite sports’ teams colors. However, what I love about the design is the triangle pattern combined with the triangular edging. (Note that the blanket itself is a square; it’s the stitch design that incorporates triangles, a great graphic detail that is perfect for a baby blanket.) Unique, fun and a great free crochet baby blanket pattern; this project works up quickly with a size J crochet hook. 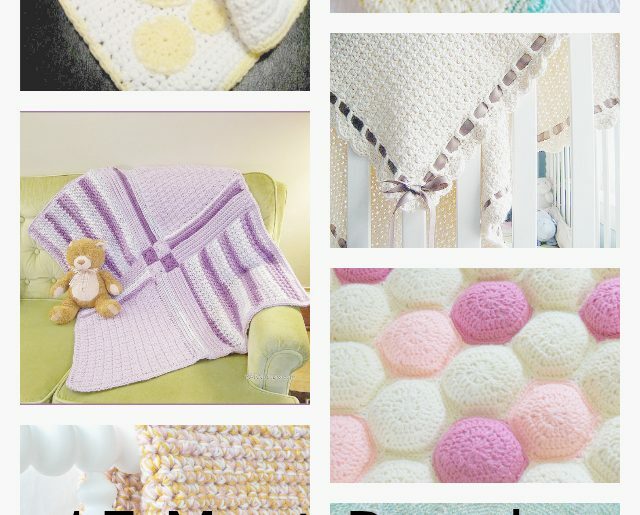 This crochet baby blanket was inspired by the beautiful Apiary Puff and Beekeepers Quilt blankets. 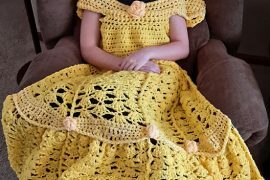 This one is a free crochet pattern from Craft Disasters that takes the idea of the two blankets and makes its own design suitable for babies. It’s a nice puffy crochet quilt that is going to feel really cozy for baby, and it’s going to feel cozy for you as you craft it! Loveys, also called comfort blankets, are crochet baby blankets that aren’t designed to cover baby so much as to make baby feel safe. They are typically crocheted with an amigurumi character in the center of a granny square, although of course there are many variations on this design. 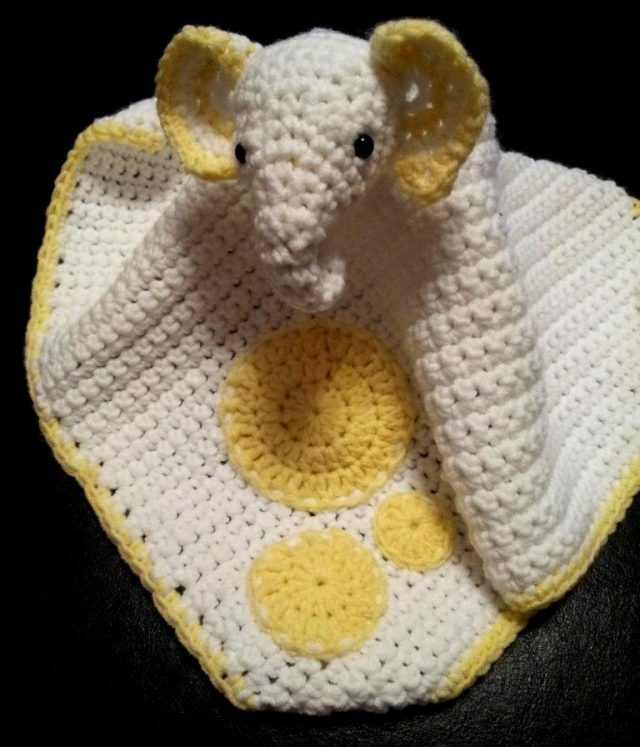 This free crochet lovey blanket pattern by Dedri Uys is actually a single crochet blanket with an elephant head character. It is embellished with additional appliqués. This pattern is designed to match her elephant puzzle pattern; she also has a Lion lovey design. This free crochet baby blanket pattern by Aesthetic Nest uses one of my very favorite techniques: multi-strand crochet. In this one, you hold three strands of yarn together and work rows of single crochet using a size S hook. The large hook and chunky yarn combo makes this work up very quickly. Since it’s just single crochet, it’s an easy pattern to do. Play around with different color combinations and have lots of fun with this one! Practice different basic crochet stitches, along with a few crochet clusters, with this sampler patchwork crochet baby blanket free pattern by YARNutopia. You’ll make five different textures in shapes that include small squares, large rectangles and different strips. This is a good design for practicing your seaming and finishing on a blanket project. 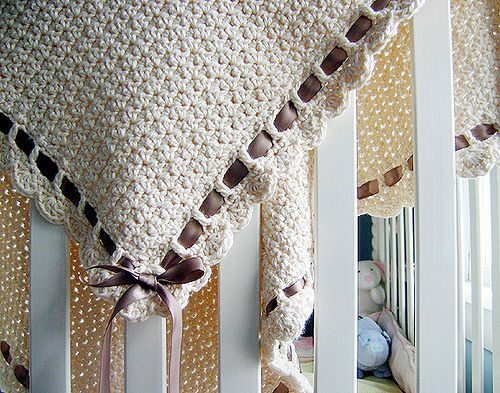 Alicia Paulson’s Tiramisu Blanket is one of the most popular crochet baby blanket patterns available for free. 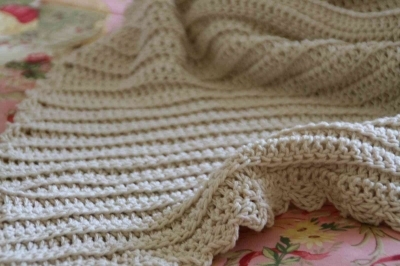 It is worked in single crochet stitches, skipping stitches strategically to create a blanket with great texture and pattern even though it uses the most basic stitch of all. This is a really smart design. The addition of the ribbon for the border makes it very special, allowing it to stand out above other single crochet blanket designs. 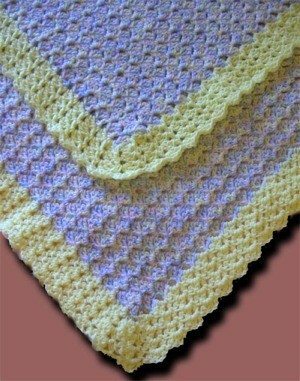 This crochet pattern is designed to be worked in cotton with a size I crochet hook although all basic baby blankets are adaptable to your own yarn and hook choice. 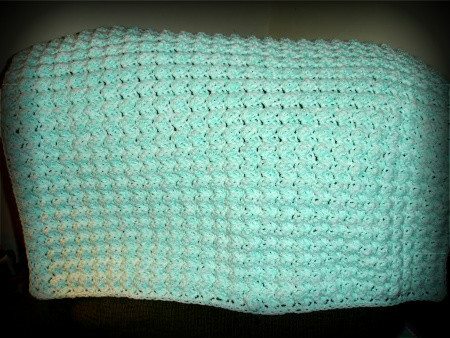 Hooded crochet baby blankets are popular because they keep baby’s head warm along with the rest of her. Baby blankets with animal hoods are especially popular because they are SO CUTE! 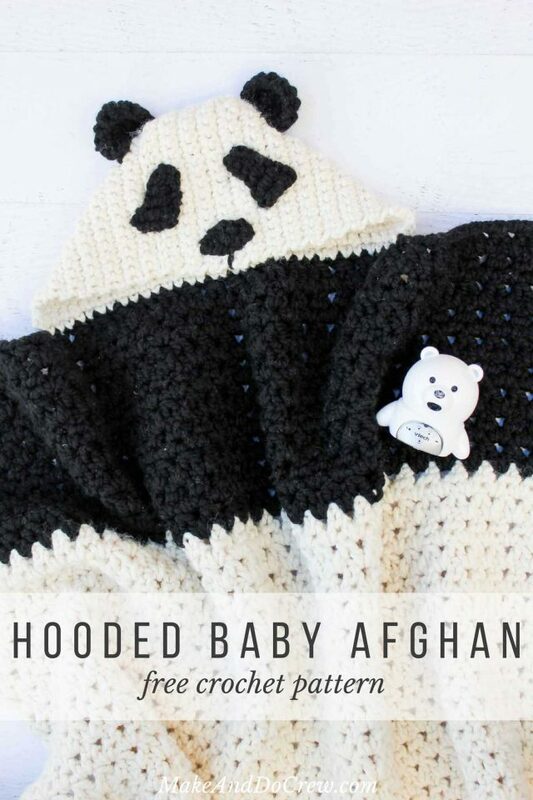 This crochet blanket is designed to look like a panda – perfect for snuggling baby and for taking the most adorable pictures. This is designed by Make & Do Crew. This is the Bubbles Baby Blanket by Yarns and Musings. It is worked with two strands held together so it’s nice and thick and cozy. The crochet texture is created by working a combination of single and double crochet in the same stitch and then skipping stitches to make space, effectively creating a “bubble” without using a bobble or cluster stitch. It’s a beginner version of the type of texture from those more advanced crochet stitches. 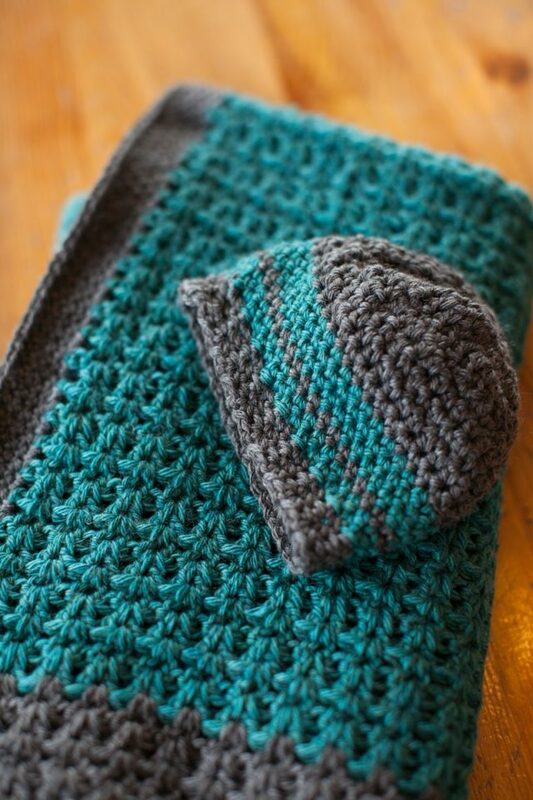 Crochet v-stitch is one of the most popular, easy stitch patterns available. The Firefly Hook has used this stitch to create a two-color crochet baby blanket. It also incorporates a skinnier version of the classic v-stitch, which is fun. It is a beautiful design. She offers a matching crochet baby hat pattern. 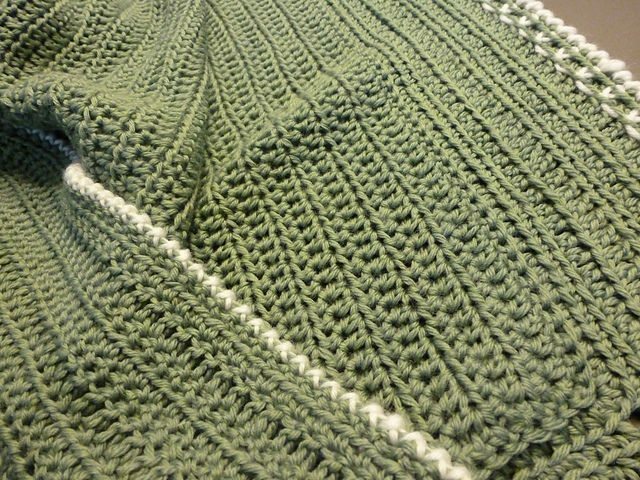 This is the sideways shell crochet blanket designed by Donna Laing for the Project Linus project. It uses such a fun stitch pattern! This is a great project if you want to donate crochet baby blankets to a good cause. 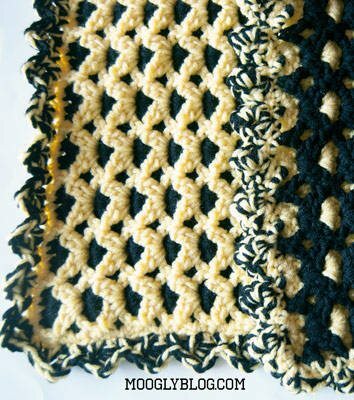 Many crochet baby blanket patterns are square but this one is a rectangle that averages 30″ x 38″. 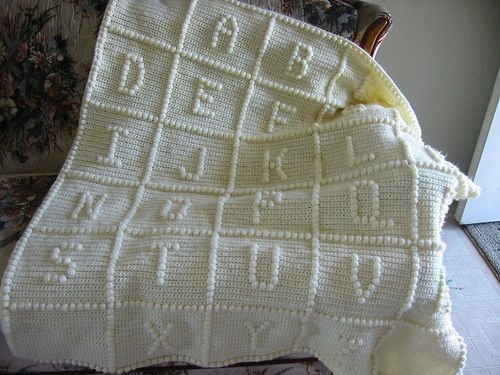 I absolutely adore this ABC crochet blanket. It’s a free crochet pattern from Caron available on the Crochet n More site. This is a chart-based crochet pattern that uses the popular technique of creating letters with textured bobble stitches. The pattern shows how to read the chart and work the design with lots of helpful tips and information. 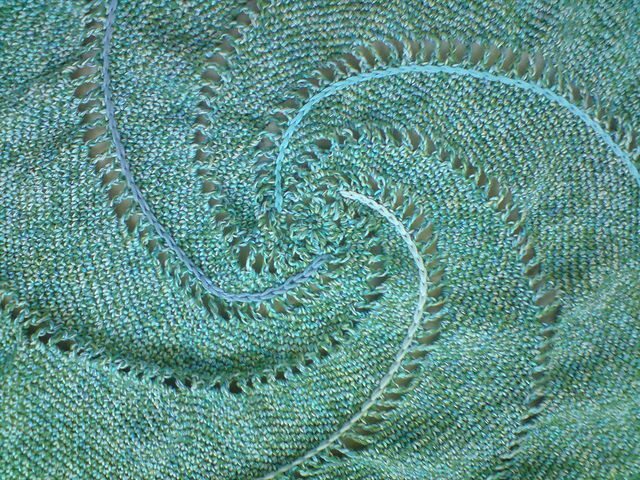 The blanket shown in the photo here is by Ravelry’s MrsDrC. If you are looking for a simple but elegant design that could be worked in absolutely any color then look no further than the classic crochet baby blanket from One Little Rayndrop. It is a cotton crochet blanket worked using a size J hook, made with double crochet stitches with added texture from working in the back loop only. Thank you so much for featuring one of my simple patterns. @MarieAnneStJean I think it’s a great choice for many people! I’m trying to find the pattern for your green baby blanket shown above and I can’t locate it. I really love this pattern and I’m sort of a beginner but I think I could do it. Can you forward me a link to the pattern or tell me how I could locate it? Thank you so much. And the blanket and hat are precious. Can’t wait to try these!! It looks like the link changed. I’ve updated it now so you can just follow the link in my post and it will take you to the pattern on Ravelry. I couldn’t find it at first either. I have made your Jiffy Baby Blanket many times. It’s not only for babies!. I’ve made a lapghan using red, white, and blue with stars. It came out beautiful. Thank you for an easy pattern that is very striking. The pattern is over on the Lion Brand Yarn website and it seems that their site isn’t working right now. They’ve got a good website so I’m sure it’s just temporary. I’d check back in a bit! Sorry you’re dealing with that. Yep, just follow the link in the post to the site where it’s posted. 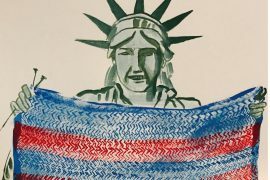 You’ll find the pattern, the graph and tips for making the afghan. I want to know about blanket crochet No. 13, How it is performed, Thank you. The links should take you to the patterns. Does that help? I responded to your first comment when you posted it. Find instructions in that reply. Thank you for these beautiful pictures. How do I download no. 2? The slip stitch pattern is missing. I have looked for it and cannot find it on the page. I make dozens of crocheted blankets for our local Linus Project. We had sort today and the lady who hosts the sort each month rejected my crocheted blankets. I don’t understand why she thinks they are not appropriate. I also don’t know why she thinks her opinion of my work entitles her to reject it. Do any of you know of specific standards that are required by the “official” Project Linus? number 8 the slip stitch is missing there is no pattern on the link provide, I really wanted have a go at making it, is the pattern available anywhere else?